Unreal Candy, an American confectionery company started by teenager Nicky Bronner, has launched an advertising campaign featuring the Easter Bunny. The Easter Bunny has announced that he has been a bad, bad bunny and issued a formal apology for the candy he’s been putting in baskets. He admits he never read the labels and was shocked to learn about all the artificial ingredients, corn syrup, preservatives and other junk in the candy that he’s been handing out each spring. The Bunny recognizes it’s a problem and as a result, he has announced that he will be changing his ways. The Easter Bunny hopes everyone will join in his movement to unjunk candy, including all of the candy companies. The Apology can be followed online at www.sorrybunny.com, the @thesorrybunny Twitter channel, Unreal Facebook page and Youtube channel. The Easter Bunny issued the following letter to day from his personal rabbit hole: “I am so very sorry. For years, I have been hopping around giving out candy, and I never read the labels. Well, recently I did, and it made my fur stand straight up. I have been a bad, bad bunny. Luckily, I found this little company, UNREAL®, that makes candy from all real stuff. It’s the best candy I ever tasted! I really think you’re going to love it. Let me know. I’m all ears. Most sincerely, The Easter Bunny”. 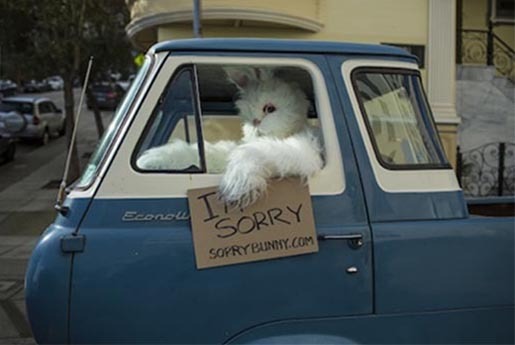 Leading up to the holiday, the Easter Bunny and thousands of his friends and family will be issuing personal apologies. 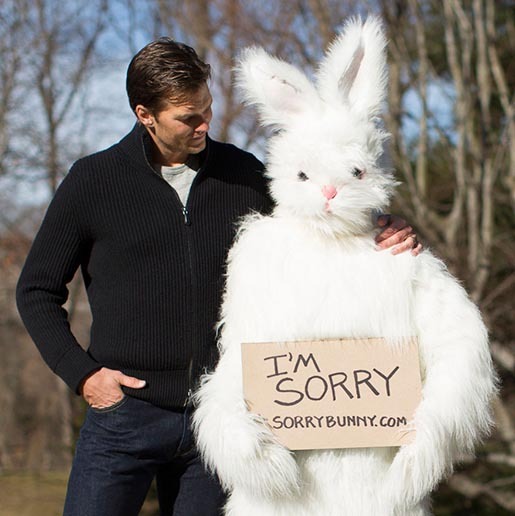 Some of the Easter Bunny’s many celebrity friends, like John Legend, Jillian Michaels , and Tom Brady, are supporting his movement to make amends. The Easter Bunny will also be handing out UNREAL – the unjunked candy. To show its appreciation for the Easter Bunny’s support, UNREAL has agreed to be the proud sponsor of the 2013 Easter Bunny Apology Tour. The Bunny invites all candy companies to unjunk their candy and join as sponsors of his future tours. The Apology campaign was developed at Crunch Brands.